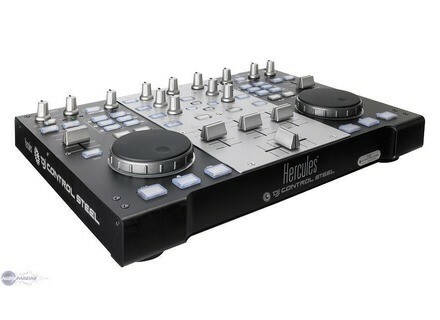 DJ Control Steel, MIDI Control Surface for DJ from Hercules. DJ V-Style's review (This content has been automatically translated from French)" Great for beginners!" This is not what controller I use today but I made my debut in the middle of the movie with him. It was my first controller, and after I invested in a VMS4 American Audio. His most it is simply extremely practical ergonomics and extremely intuitive interface that allows anyone to succeed nice transition. His least is the lack of sound card, but for an amateur dj that does not matter because little direct use of the computer. The price rise is fairly new, but I think there is opportunity to make a good deal, especially since the production is pretty good and the controller is relatively strong. 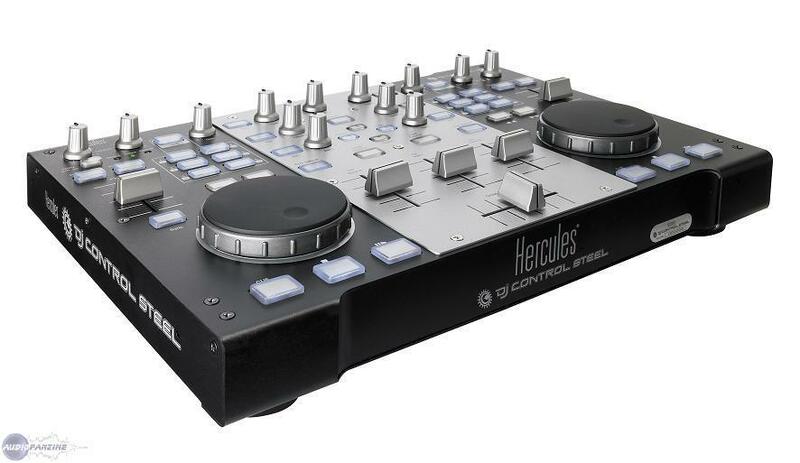 I recommend this controller to everyone who wants to start and grow in the middle of the mix and animation, it is a formidable gateway turning any individual amateur DJ. Note that to continue to break into this community it will be necessary to invest in another type of material, but we must compare what is comparable, there is no equivalent in this product line. Will Zégal's review (This content has been automatically translated from French)" Very good for my amateur use"
No, not the masses, even if I had the opportunity to put their fingers on some entry-level models. Difficult to judge the quality / price without more experience. What I can say is that for the price, it satisfies me. I'm not really DJ. Even if I happen to have paid a few evenings a year, I mix mostly for fun, for parties at home and among friends, and the small bar at the corner of my street. And yet, when I say "I mix" is rather simple for the time sequence of songs, even if I start to go a little further. After a few years juggling a classic console (not even DJ, so without cross) and multiple sources (mp3 on computer, CD player, sampler phrases), I wanted to spend on a cheap solution to DJ, but not a cheap product so far. The DJ Steel perfectly corresponded to that expectation. With the accompanying VirtualDJ, it's a simple config and easy to use for my own use, I am certainly not ready to come at the end of the possibilities. eljulow's review (This content has been automatically translated from French)" Really not bad!" The Hercules MK2 home forever, and if not CD players like the Denon DNS-1000. Not too bad, but I admit it must then add the money to buy a sound card (if only for the preview!) And mixing software functional (transition to the pro version of VDJ, or purchase Traktor ...) So ultimately the quality / price takes a hit! No, I'd rather spend on the DJ Console RMX, which will at least have a sound card rather than buy cheap (100 € less than the RMX) to take a sound card (100 € for that matter) next which will add load to your PC and causing small lag! To start is not bad, you can mix without breaking the bank ... but do not expect to use it in the evening pro! Djfoxydu29's review (This content has been automatically translated from French)" Good product for small budget"
The best: compact but not too tight, the top aesthetic, strength of the chassis (fader knobs and a little less ...) and price! Minimum: MIDI implementation weird sometimes, but it is the only flaw! Yes, because there, on that table, all the functions necessary to mix like a table Behringer DDM4000 for example, which is very nice, but not in price! I use it for a month with the accompanying software, so virtual dj 5 in limited edition. It is easy to learn and practice transport. I dj test tonight and it's worth the money. Sr Although it is not worth two turntables and a mixer but its price is well trs. For beginners and a small budget is a good machine trs. I have design and quality manufacturing, once more connected to the mac pro, I signal a problem. I use Virtual DJ 5. Plus: a bag to store it in to the shelter of the dust. Or go to mix among friends or why not a live. Nice touch faders and pots. The set off a real feeling of solidity. "Shift" limited to certain buttons. MIDI implementation poorly described. Sending a message on the control switches shown in another. Yes: Vestax VCI 100, M-Audio X Session, Faderfox DJ Kontrol DJ. I put the same level as the level vestax grip, though a bit more cumbersome, it allows to have controls enough apart to avoid them tangling fingers. Yes. My choice was motivated by my lack of need for a controller with integrated audio interface.